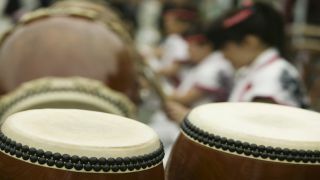 The Mugenkyo Taiko Drummers Assembly is back with a brand new show. The drumming troupe return to the Edinburgh Fringe Festival armed with a set which is claimed manages to fuse "traditional taiko spirit with a modern image and sound, with dramatic lighting, theatricality and humour, and contemporary musical sensibility." Sounds good to us. Mugenkyo formed in 1994 and is one of Europe's leading taiko drum groups. They will perform at Assembly George Square as part of the Fringe from 1 to 26 August. For more information head here.